The elm has fallen away from public consciousness in favour of our more iconic trees – fir, birch and pine, among others. Here, Max Coleman argues for the elm to regain its central position as a tree worth noticing and nurturing. Losing the names for nature in everyday language can be viewed as symptomatic of a wider problem. The common concern about this linguistic loss is that we are gradually losing our sense of connection to nature. Why, after all, would we care about plants and animals we cannot put a name to? The names of what many people would regard as familiar wildlife are being removed from children’s dictionaries, and this has galvanised efforts to bring nature to life for children. I wholeheartedly support anything that seeks to connect people with nature. My own small contribution to this effort has been to wave the flag for one of Scotland’s most majestic, and also most forgotten, native trees – the wych elm. The wych or Scotch elm, Ulmus glabra, has been growing in Scotland for around 9,000 years. We know this from radiocarbon dated pollen extracted from bogs and lake sediments. Not only has it been here longer than people have inhabited Scotland, but it has also proved itself to be incredibly useful to us. An unusual quality of elm wood is that the fibres are interlocking. This makes wych elm resistant to splitting and yet flexible at the same time. As a consequence, elm has been the wood of choice for a range of specific uses including wheel construction, boat building, furniture making and archer’s bows. So why, you might reasonably ask, has a tree with such strong cultural connections, perhaps back to the earliest Scots, fallen from our consciousness? It is not that people don’t care about trees; far from it. Some of the largest and most influential environmental charities have grown out of our love of trees and a desire to protect both trees and woodlands. Perhaps the most obvious reason wych elm has failed to keep up with the likes of oak, birch and our national tree, the iconic Scots pine, is that we no longer rely on wood as we once did. Unfortunately, the great utility of elm is irrelevant in the modern world. Granted, there has been a revival of interest in bespoke furniture made from native hardwoods, and elm has been prominent in this for its structural qualities and the beauty of its grain. However, the elm items that quietly kept life ticking over such as wheel hubs, boat keels and water pipes have long since been replaced by other materials or new technologies. Elms of all kinds have also been hit hard by disease which has dramatically reduced their numbers and made them much less prominent in the landscape. This might just seem like bad luck, but in fact is actually due to our own actions. Hardly a month goes by without a new tree health story in the media. Although the media do tend to sensationalise things it is certainly true that the increasing global movement of people and goods, including plants and plant products, has made the inadvertent introduction of pests more likely. This can lead to potentially devastating consequences for trees. To combat the growing threats to plant health the watch word these days is biosecurity. This involves all of us being much more aware of the risks of moving pests around and taking measures to limit them. Boarder inspections, quarantine facilities and disinfectants are some of the measures that are becoming increasingly familiar. Home grown plants are being promoted to avoid the risks associated with imports. But, as far as the elm is concerned, this is all a case of shutting the stable door after the horse has bolted. The elms nemesis, Dutch elm disease, is a fungus that evolved into a virulent strain as a direct result of the global trade in timber. The aggressive form of the disease arrived in southern Britain in the late 1960’s on infected timber from America and has been spreading north ever since. When the disease arrives in an area nearly all the elms die, and we no longer attempt to keep track of the losses. The best guess is that between 20 and 80 million trees have disappeared from countryside and town alike. Entire landscapes in England have lost the qualities provided by the distinctively shaped English elm. In Scotland some areas where wych elms were common have also been transformed. Yet all is not as gloomy as the media would have you believe. Nearly everywhere a scattering of elms have survived. The exact reason why is not yet fully understood, but these trees are a source of potentially disease resistant stock for the future. The other cause for optimism is that northern Scotland is a rare refuge for the elm. Dutch elm disease can only get about courtesy of elm bark beetles. These small flying insects have certain minimum temperature requirements that must be met before they can disperse to new elms. It seems that the far north and west of Scotland may be climatically just outside of the comfort zone of these beetles and so beyond the reach of the disease. Lest we forget it, Scotland’s elms are rare survivors that should be cherished. 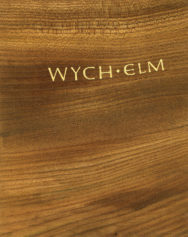 Wych Elm by Max Coleman is out now, published by Royal Botanic Garden Edinburgh priced £20.